Whether as a survival strategy or fun, learning how to raise goats can be a rewarding experience. Goats are an excellent source of milk, meat and lawn control and are much easier to rear than sheep or cattle besides being very hardy animals. Toggenburg – This breed is small, white, with stripes on its legs. It comes from Switzerland, but is commonly bred in the USA. It is a good breeder, can forage easily and is affectionate. Saanen – Also from Switzerland, this breed is similar to the Toggenburg, but is bigger in size. It is totally white and is great for milk. It is bred primarily for its good quality and quantity of odor free milk. Alpine – A Swiss breed which originated in France, Switzerland and the UK, it is faded white, often with white stripes on black. It is also renowned for its milk like the Saanen and Toggenburg. LaMancha – Of Spanish origin with Swiss and Nubian cross breeds, this breed is fleshy and used more for meat than milk. Its milk yield is less, though it is higher in fat content. Anglo Nubian – Bred in England, though common in the USA as well, this goat is hardy and a heavy breeder, again known more for its meat than milk. 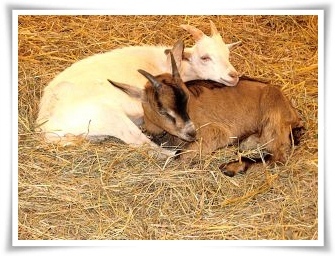 Pygmy – From Africa, these hardy goats are small and capable of breeding all year round, which is a major plus point. Because they are so small they are perfect for the mini-farm with five acres or less of land. Other goats – While the above are pure bred goats, there are many breeds of goats, many of which are cheaper than pure breeds, but still yield good amounts of milk and are easy to breed. Considering how to raise goats from a feeding point of view? Goats eat grass, hay, plants, shrubs, and leaves. If there is shortage of roughage, you can feed them grains like barley, corn and oats. Left to themselves on open ground, they will graze whenever they want. If the forage is limited, you may have to feed them 14% all feed and hay twice a day. If there is no river or water source nearby, keep in mind that a goat will need about three-four gallons of water a day and water should be kept in an accessible place. If there is a river, you may have to ‘show’ the goats the river and take them there as they will not be able to figure it out on their own. An important aspect of how to raise goats is that you need to fence them in as they are frisky and can easily wander off. The fence has to be strong and high enough for the goats not to be able to jump over the fence or knock it down. Have enough space – each goat needs 15-20 square feet of space. Goats have a natural pecking order and if they are over crowded you have major problems. They need more space for grazing and wandering around, so you do need a fair bit of space, depending on the number of goats you have. It is always a good idea to keep more female goats than males; bucks are strong smelling and difficult to manage when females are in heat. However, does will need to be impregnated though you can take them to a goat farm, which keeps bucks for this purpose. One note on the smell: Pygmy and dwarf bucks have considerably less smell than the larger bucks. When milking a lactating goat, make sure to remove all the milk, otherwise the milk production will decrease and eventually stop. Goat’s milk has good butter fat values and is easier to digest than cow’s milk. You can make cheese from the milk. Butter may be a bit difficult as goat’s milk is more naturally homogenized so has smaller fat molecules, but it can be done. Too many young goats means that they can be slaughtered for their meat. The benefits of how to raise goats outweigh the negatives and goats are good companions for children as well.